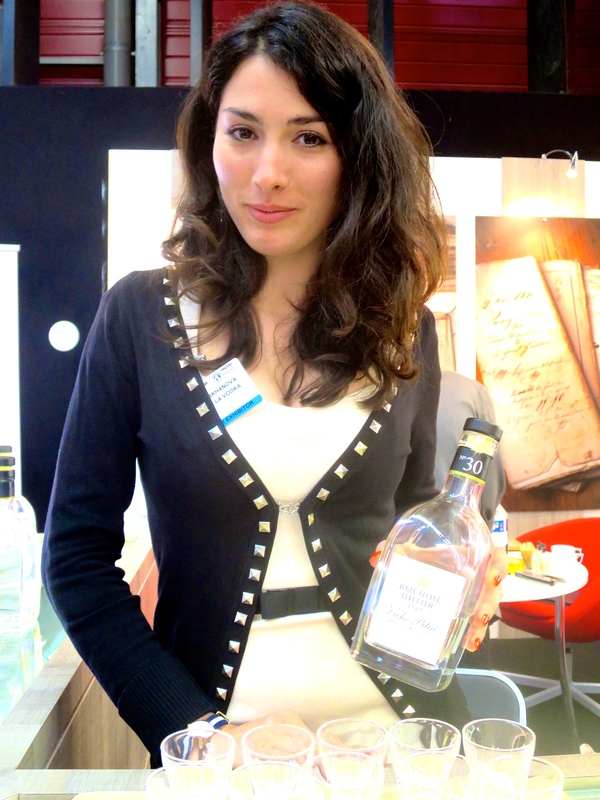 My first ever visit to VinExpo (2015 in the city of Bordeaux) was an eye-opener. It was a massive yet well-organized event with easy accessibility, plenty of restaurants, and impressive information booths. Forty-five thousand visitors from 120 countries attended, as did more than 2,300 exhibitors. (Thanks Jemma Lopez and Valérie Eymas for organizing tickets). The event includes far more than wine. Some unexpected surprises included the following. 1. Ukrainian wine made from the Albariño grape – (typical grape from the Galicia region of Spain). Crisp and delicious after 12 months in oak. Affordable? Very much. Nice job Yuri, Andriy, and Eugene from Kámyanka Global Wine. 2. 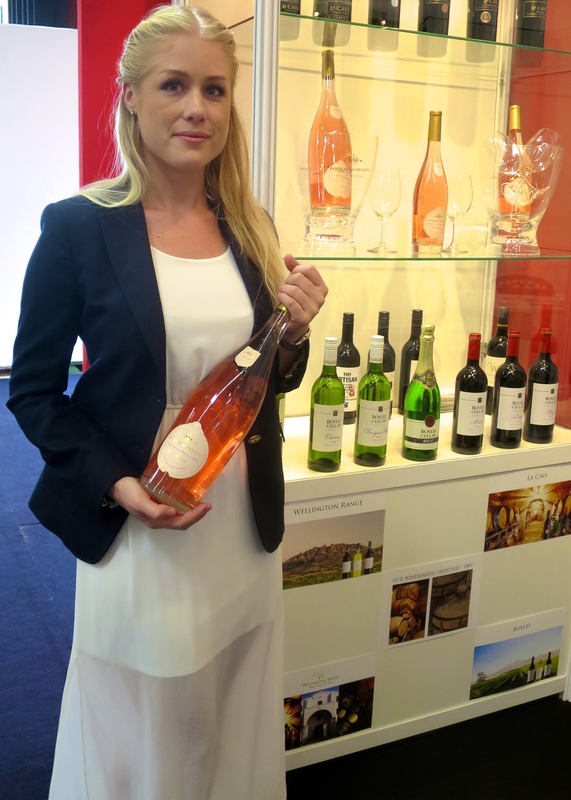 Provence Rosé packaged and sold by…..Swedes (Bodvar). Delicious. Thanks for the introduction Linn. 3. I was reminded how good Burgundy wine is like music by the Beatles: it’s without peer, and seduces not through power or repetition but by being fresh, light, and original. Thanks Aurore (and introduction from Valérie) for sharing amazing tastes from Domaines Devillard (including Château de Chamirey, Domaine de la Ferté, and Domaine des Perdrix). 4. French vodka. No kidding. Viche Pitia makes vodka using an 18th century Russian recipe. The option that includes caraway may have you substituting vodka for wine as an aperitif in the future. Thanks Pierre and Suzanna. 5. Aerosol cocktails. Flavored with carrot, olive, beetroot, basil, thyme, and cucumber, these alcoholic spritzers (‘Garden Party’) may well liven up the New York cocktail scene. Merci Charlotte. 6. Whiskies from the Isle of Man, and from Japan. Unfortunately I never returned, as promised, Julie and Lynn of Lombard Brands…my loss. I thought the Isle of Man was well-known for the Manx Mountain Marathon, not for producing whisky. But – nice job you do. I also learned how in 1918 Matsataka Taketsuru became the first Japanese citizen to enroll at the University of Glasgow to study Scottish whisky making. A decade later, with his Scottish bride, he founded Nikka Whisky in Japan. This amazing man was well ahead of his time. 7. Poetry and tears from Italy. 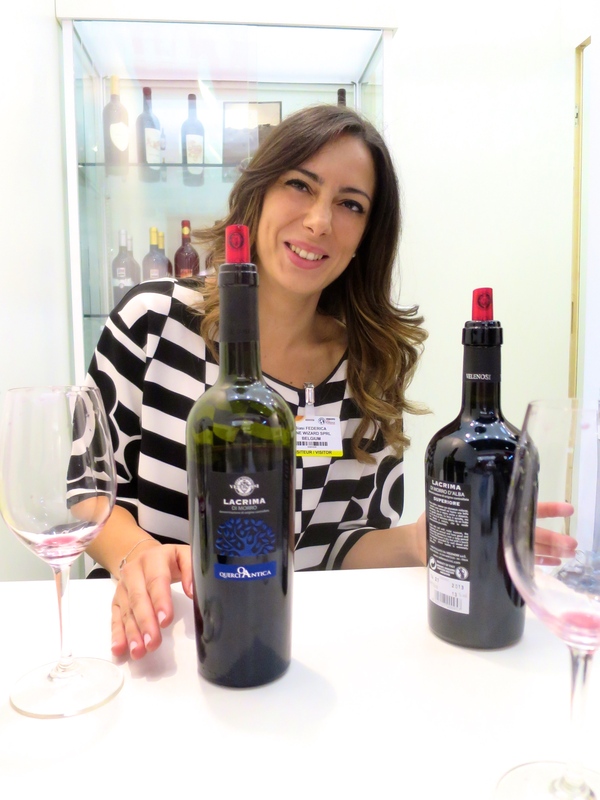 Sommelier Federica Biasi introduced us to winemakers from the Marche and Abruzzo regions of Italy. 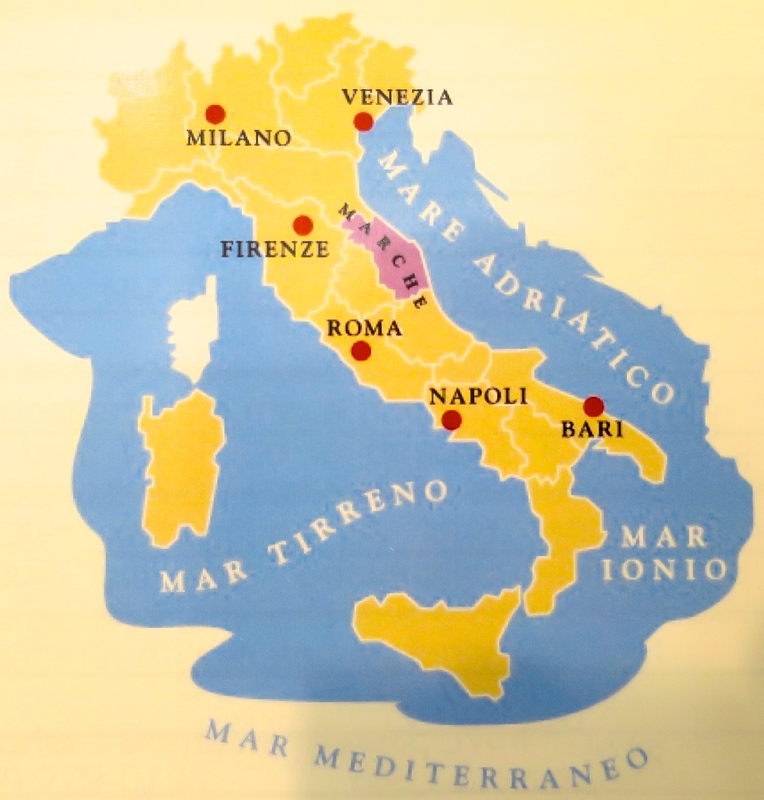 Marche is one of twenty regions that comprise Italy, located southeast of Tuscany along the Adriatic Sea. Here we also tasted wine made from two grapes – white and red – I never heard of before. The first wine the men from Velenosi Wines shared was made from the grape Pecorino. I had never heard of this grape, but did recall that Italians call cheese made from sheep’s milk ‘pecorino.’ Andre Bianco, export manager for Velenosi, told two stories of how this grape may have been named: either because sheep like to nibble this grape, or because small bunches resemble a sheep’s head. Pecorino grapes produce white wines with naturally high alcohol content (14 or 14.5 percent) that have a zesty, fresh, mineral and citrus taste. To obtain the Italian DOCG classification these grapes must grow between 400 and 600 meters above sea level. This is ideal terrain not only for growing Pecorino, but as Andreas explained – it’s also ideal terrain for living – on mountain slopes that face the sea. In addition to stories, Italy’s poetic language permeates the life of these wine producers. The motto of Velenosi is: Il vino è un’arte capace de far sognare (‘Wine is an art that makes us dream’). The second grape that Andre and his co-worker Ulisse Patalocchi introduced us to was the red Lacrima. The word ‘lacrima’ means ‘tear’ in Italian. Being a good storyteller, Andrea explained how the skin of this grape is thin, and can easily break when it is mature, producing a ‘tear’ of juice. Lacrima grows in the southern region of Marche, close to the city of Ancona, and is classified in Italy as DOC. The Lacrima they served was aged one year in oak barrels, with grapes late harvested to boost their concentration, thereby producing a rounder, more complex taste. Only 150 hectares (about 370 acres) of Lacrima exist. The taste of the wine is unique enough that many well-known restaurants in northern California serve bottles of Lacrima. I also enjoyed their blend of 80 percent Lacrima and 20 percent visciole wild cherry syrup, added to produce secondary fermentation (in ancient times, sugar from wild cherries helped preserve wines). And when this liqueur is mixed with sparkling wine? Meraviglioso! (Wonderful). Satisfied with tasting and stories, we moved to the nearby booth of Tenuta I Fauri. 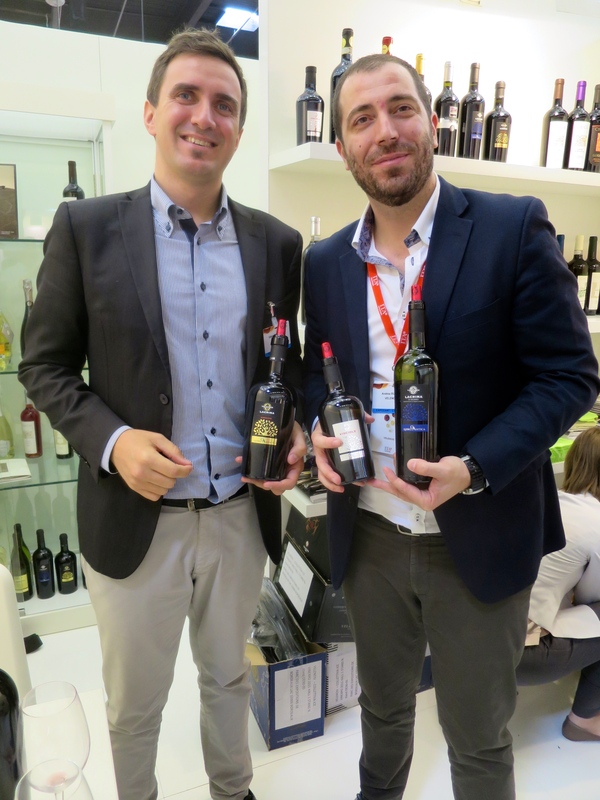 Here, a brother and sister team from the Di Camillo family produce Pecorino and Montepulciano wines within the Abruzzo region, south of Marche. Tenuta I Fauri were among the first winemakers in the region to produce Montepulciano d’Abruzzo wine without oak, to better highlight the taste of the grape. Their Pecorino is also clean and crisp and very affordable. Pecorino and Lacrima…..two lesser known Italian wines worth seeking out. Thanks to the Italian, French, and Brazilian sommeliers Federica, Tristan, and Dg Veiga for the introduction! Hope you are doing well! 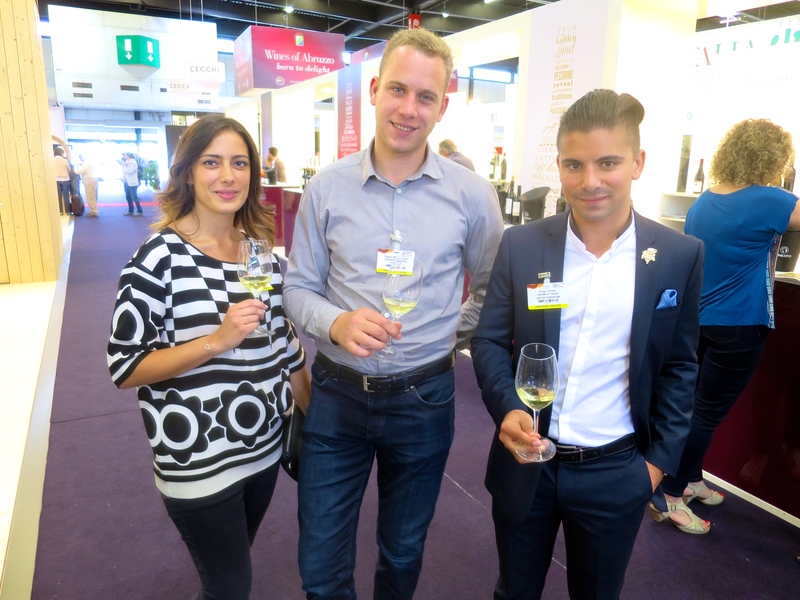 It seems that you’ve really enjoyed your first Vinexpo…Great article! 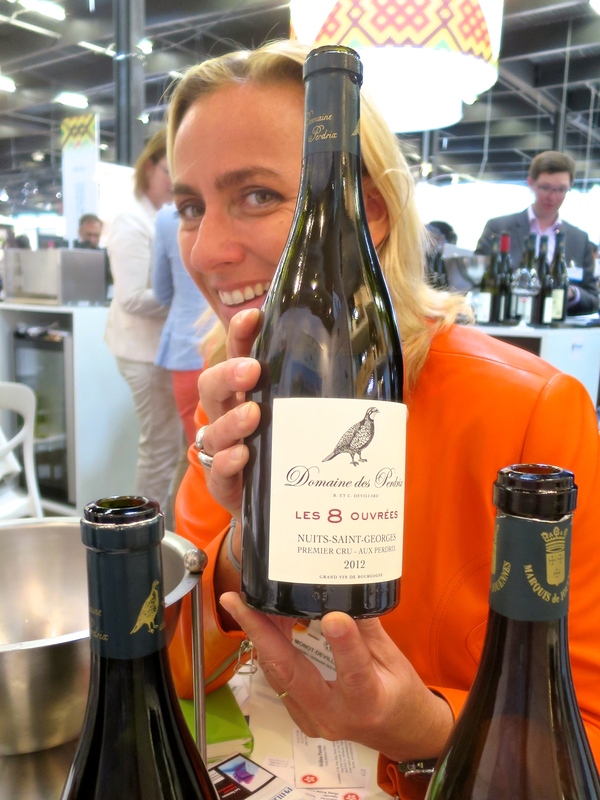 “Where are the Male beauties of Vinexpo?” With beautiful winemaker species such as Jérôme, Mariano, Thomas from L’Espérance, Yann, and our ambassador Leslie ??? Yes! And I am looking forward to tasting more…beautiful wine.